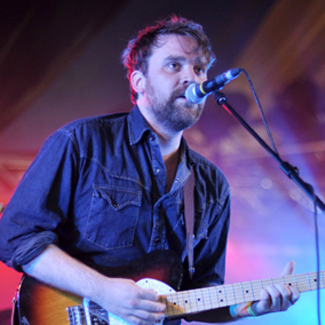 It's little over four years since Frightened Rabbit's last visit to The Sage Gateshead; a fleeting period in the grand scheme of things, yet one which in musical terms represents a vast yearning gap. That certainly seems so in the case of Selkirk's finest, who upon their last visit arrived as virtual unknowns hot on the heels of gargantuan sophomore The Midnight Organ Fight, a stonewall modern classic from which the quintet have truly never looked back. Now, of course, Scott Hutchinson and company are beginning to outgrow their cult status, with a major label deal and UK top 10 album to their name, not to mention a reputation that's well on its way to joining the likes of Belle & Sebastian and Arab Strap in the realms of Scottish folklore. Comfortably selling-out the venue's second room, this show was further evidence of their meteoric rise, aptly showcasing the strides they've made whilst also providing a night that'll live long in the memories of all in attendance. With new album Pedestrian Verse a mere three weeks old, it's fair to say most of the anticipation prior to their appearance was reserved for untried material, which - as sales figures suggested - most fans were already well familiarised with. As it transpired, however, these fresh cuts were far from the highlights, with many lacking the impact and urgency of their recorded guises, an issue which if nothing else illustrated just how well produced the new record is. They weren't bad by any means, but the only real exception to this pattern was "Acts Of Man," which closed out the main set with an avalanche of monster riffs and life-affirming sentiment which practically set light to its somewhat more restrained studio version. Luckily, no such issues were experienced when the band delved into the more established reaches of their catalogue. Predictably, most standouts were lifted from The Midnight Organ Fight, which remained refreshingly well represented in spite of the more commercially viable collections which have followed. "The Modern Leper," "Old, Old Fashioned," "My Backwards Walk," "Head Rolls Off," "Good Arms Vs Bad Arms;" all were simply stunning, yet each and every one of them was instantly blitzed the moment Hutchinson strode past his mic with the intention of playing "Poke" acoustically, before a silent, captivated and borderline tearful audience. It was a genuinely unforgettable moment; punters barely daring to draw breath as the singer's tortured words reverberated around the circular amphitheatre, staggering in their intimacy and making full use of the room's magnificent acoustics. In all honesty, it cast a shadow over a night which even at its lowest points was rarely less than sublime, and acted as a stark reminder of what will inevitably be lost in the rapids of success. Already dwindling, you get the impression such instances will become few and far between as venues and crowds grow larger, a reality which only adds to the extent to which they should be savoured. It's a development which will only widen the gap between them and their fanbase, but Frightened Rabbit's new found success could scarcely be more deserved, and so long as they continue to make great records and pour so much heart and soul into their live performances, you'll be hard pushed to find anyone begrudging them.